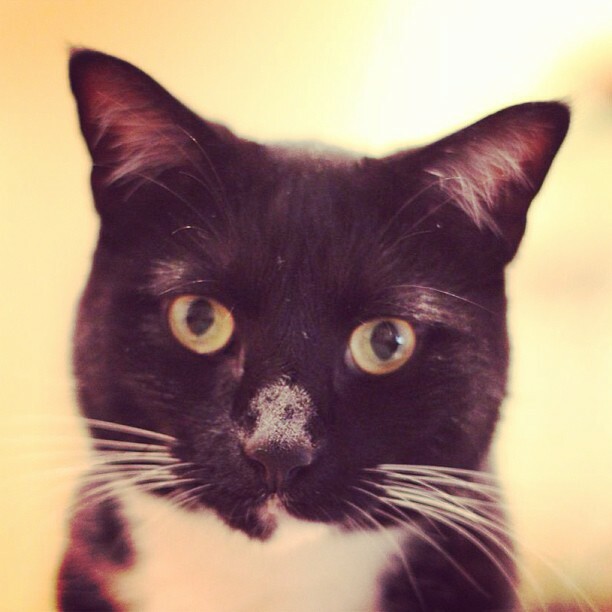 first, i would like to thank everyone who visited my blog last week and for all the comments! i appreciate you! on to this galette . 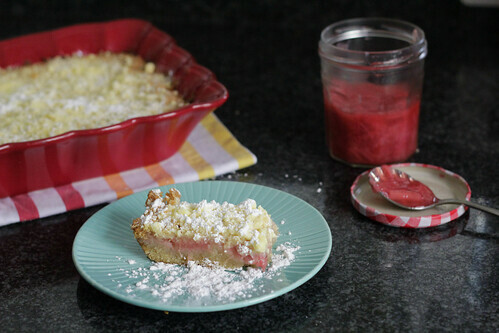 . . such a fancy name for such a simple, rustic and homey tart. this was light, thin crust and studded with crunchy cornmeal. just the right note with sliced peaches and the most blueberry-tasting of blueberries i've had all summer. i was a little less than excited about two weeks of pie . 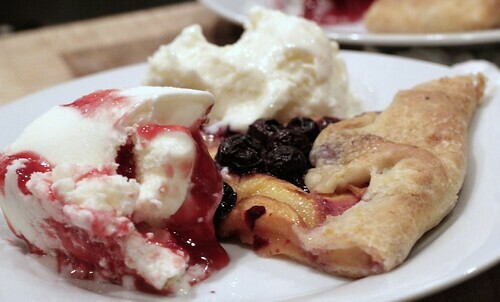 . . see last week's posting if you have any questions about my pie attitudes. while the closest this galette gets to my beloved streusel topping is the crunchy turbinado sugar on the crust edges, i would make this again. it's the type of light summer dessert that perfectly highlights the natural sweetness of any fruit at the peak of it's season. and it's so light you can serve it with ice cream. lots and lots of ice cream. this is sweet corn ice cream with raspberry chambord sauce and lemon frozen yogurt with white chocolate. thank you, again, jeni's fabulous ice cream recipes. the ice cream? it was for the birthday girl. birthday galette on a steam august evening, after a night of champagne cocktails, cut-throat board gaming and good friends. not bad way to wind down the summer. 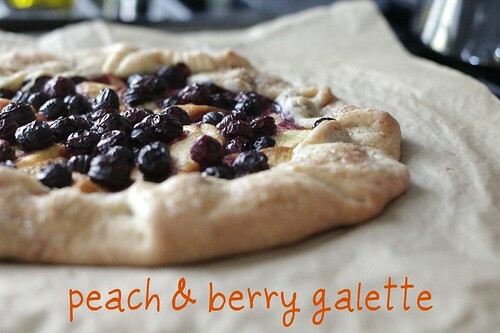 to find more posts on this lovely galette and the recipe, visit tuesdays with dorie! it was a good weekend, full of family, sunshine and good food. also, many photos in extreme variations of lighting and camera source. brace yourself. 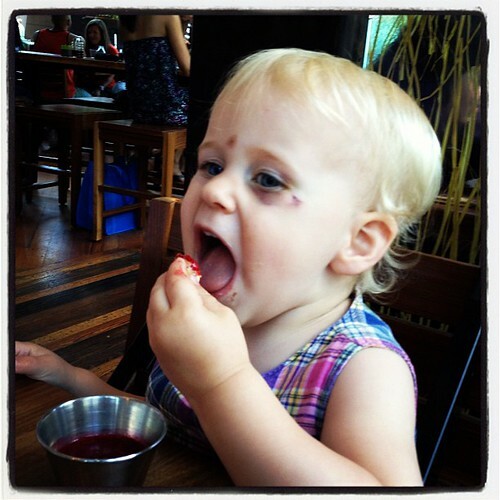 everything tastes better when eaten with your fingers and an endless supply of raspberry sauce. 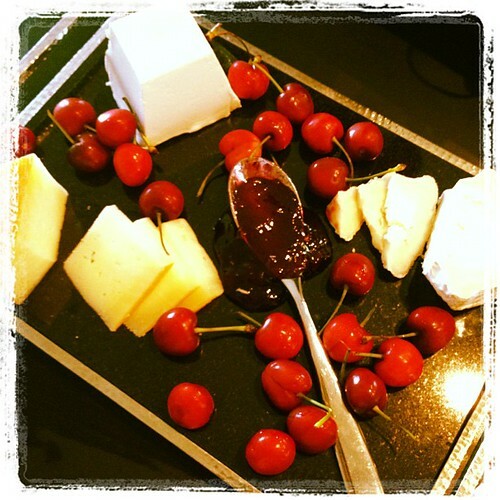 goat cheeses and cherries . . . summer berry season is officially in full swing. you know it's a good weekend when it includes more than one birthday cake. berries & cream was my contribution. my cake talked a good game. 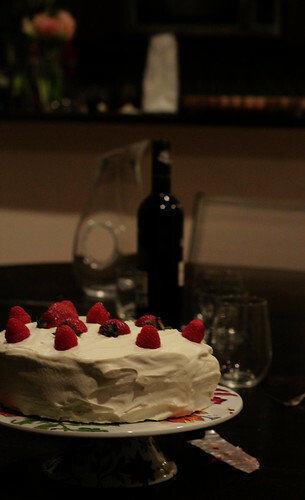 a light genoise, layered with macerated berries and whipped cream frosting. my execution? well, it looks pretty. and i learned an important lesson about how long you really, really, really need to whip your eggs for a genoise. the bottom layer did not raise. my generous father-in-law may have called it a tasty crust. but, also? fresh summer berries, macerated in a little booze, plus whipped cream frosting? made for a very special birthday? 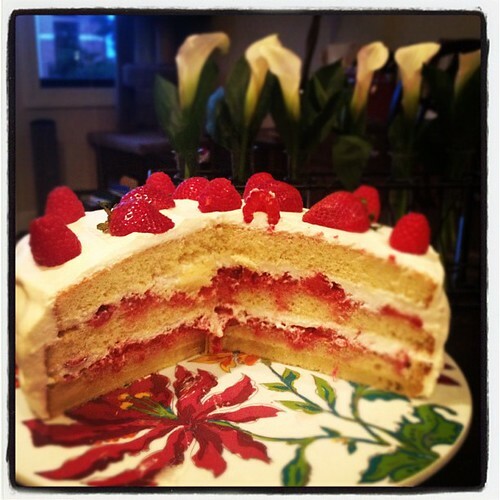 for the recipe – french strawberry cake - visit tuesdays with dorie. 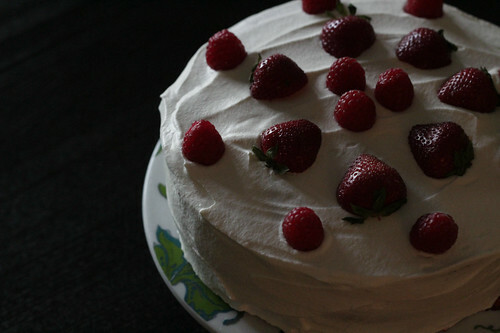 make extra whipped cream frosting and macerated berries. and whip your eggs! summer has arrived. with a vengeance. 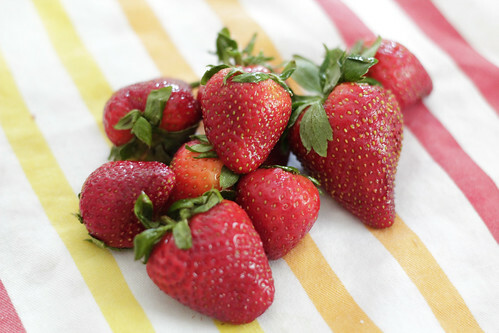 luckily, we can temper the crankiness brought on by heat and humidity with the sweet pucker of strawberries. 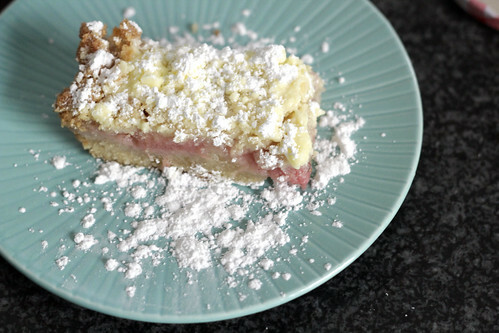 i love the classic sweet tart of strawberries and rhubarb. i like my food with balance. not too much one way or the other. the way a sprinkle of sea salt on dark chocolate brings the sweet and bitter together a little more harmoniously on your tongue. if it is pink, all the better. i learned a new technique with this recipe. you put together the dough, chill it, and then grate it into the pan. 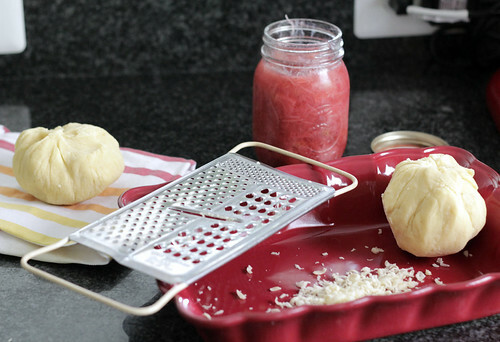 the grated dough sandwiches homemade jam of the strawberry rhubarb vanilla bean persuasion. don't be tempted to add something sweeter. 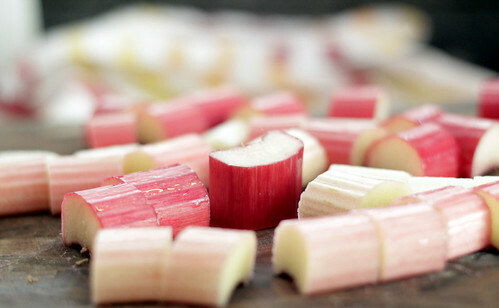 it needs a bit of the sour bite of the rhubarb. and the vanilla bean deepens the flavor a bit. i love the almost woody caramel flavor of a real vanilla bean. grating the frozen dough keeps the butter cold but brings a lightness to the finished cake. because, let us be clear. if you are looking for the crisp crumble of a walker shortbread cookie, this is not your recipe. 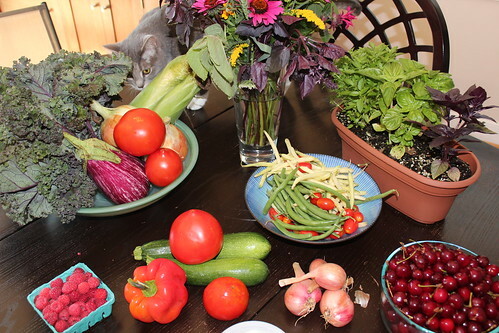 we are back to the farmer's market this week. i was seduced by a plum. it's hardly my fault. there are lots of pretty plums in the world. the typical red Satsuma plums. the little yellow and green plums. 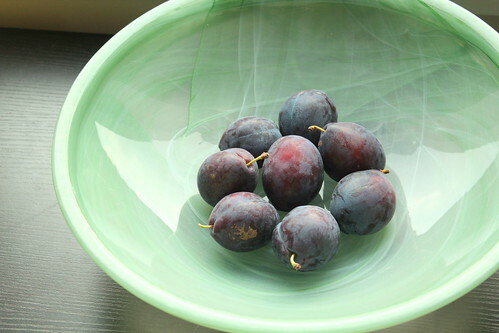 but the plums that got me were these. italian prune plums. so dark purple they are almost blue with a lovely ashy skin. according to the internets, they aren't so good for eating out of hand, but better for baking. especially on a stormy summer afternoon. sold! manchego liked them too. 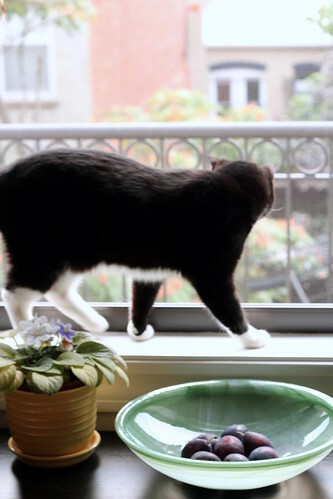 or maybe it was the squirrel stealing our cherry tomatoes outside the window. just kidding. the porch plants are so weak this year, the squirrel has given up on us. i've given up on us. on the plus side, since i've stopped watering the squash and tomatoes, i have SO MUCH MORE TIME. war and peace kind of time. 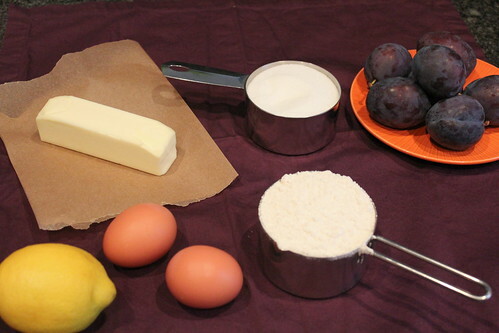 plum cake kind of time. sincere apologies to the dear friend who helped keep them alive during our vacation this year. i started the summer with such hope. there's always next year. 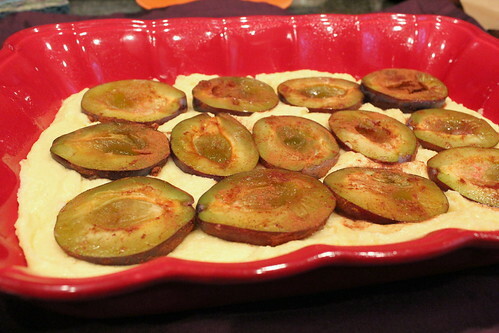 there are a lot of plum recipes out there. tarts. 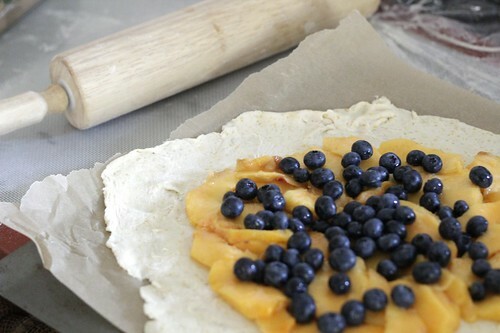 ﻿﻿rustic crostatas and galettes. crepes. treats involving almond flour, pastry cream, spring-form pans. sorbets for those uninclined to turn on the oven. if you are feeling ambitious, i encourage you to try any of those yummy looking recipes. me, i've been on a lazy streak lately. i googled until i found something super easy. yet, something classic. something blessed by not just the new york times and the spendid table, but also by an anonymous chowhound commenter. let's get started. halve those plums. so pretty, the pale green center with the dusty purple skin. i'll be honest – the pits were a little bit of a b*! 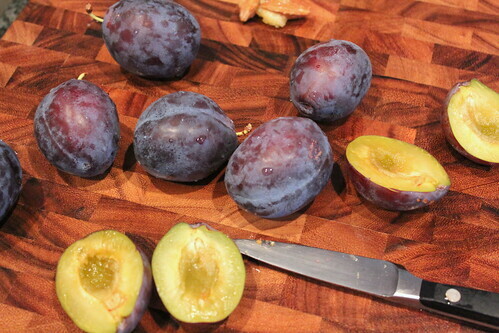 @& to pry out of the plums. we had words. 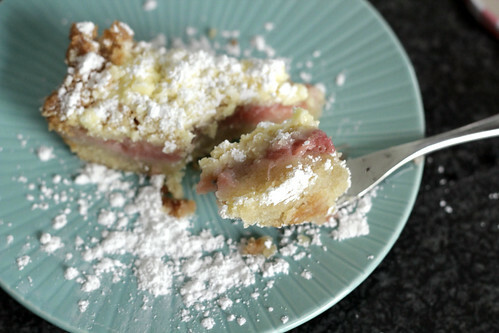 once you've liberated your plum halves, let them hang out with the lemon juice and cinnamon. then nestle them in the batter. the batter is thick and sticky. the plums cook down and get jammy. they stay a little tart, which is a nice foil against the cake, which is sweet but not too sweet. not as sweet as the amount of sugar would lead you to believe. 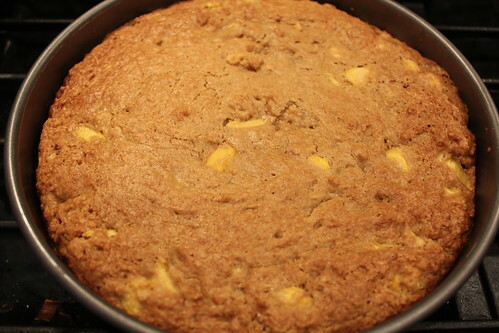 and the cake has a nice light crumb. the edges of the cake are a lovely chewy crust – and with a slightly gooey center, it's kind of like a really good brownie. without the chocolate. win some, lose some. i slightly undercooked the cake. don't be like me. gooey is good – but the middle of my cake was inedible. don't tell the cake police. just bake your cake until it's done! crusty, chewy, just the right amount of gooey. see? it's even like the cake is smiling. Halve and pit the plums. Toss with 2 tablespoons of sugar, cinnamon and juice of one lemon. Let the plums soak up the goodness. Cream butter and 3/4 cup sugar. Let it get good and fluffy. Add flour and baking power and mix until just combined. 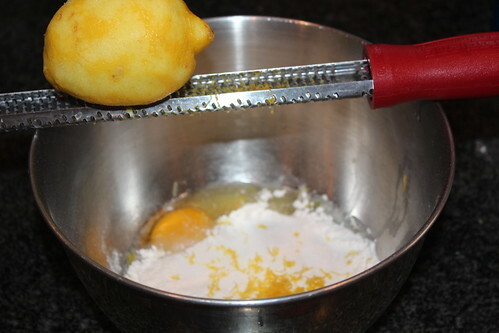 Add eggs, salt and lemon zest, and mix again until just combined. Light touch! Scoop into a greased baking dish. I used a 12x9ish baking pan. Nestle in your plums, skin side down. Don't be shy with that cinnamon. Bake for about an hour or until the middle isn't gooey. Let it get good and golden brown. 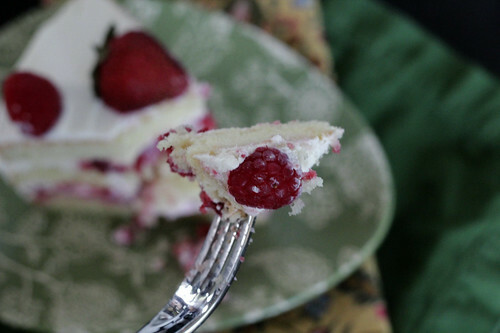 Cool, slice and serve with a little powdered sugar! the theme of this post is: don't be like me. don't forget to bring your butter and cream cheese to room temperature. don't forget to add the peaches. and, for all that is holy, don't forget to add the flour. we are not inventing flourless peach cake around here. grody. 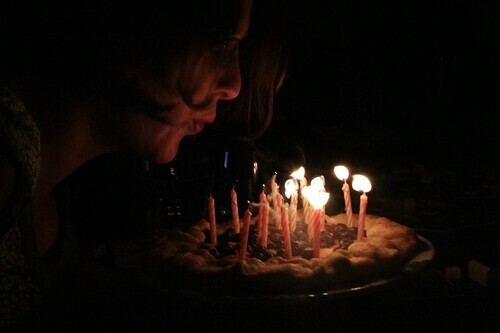 that said, all of those things happened to me when i made this cake. an audience of distracting girlfriends discussing vampire novels and work drama and some cocktails featuring passion fruit juice, limoncello and blackberries may have been to blame. or i'm just a ditz. in any event. the cake turned out just fine. there are few problems you can't solve. 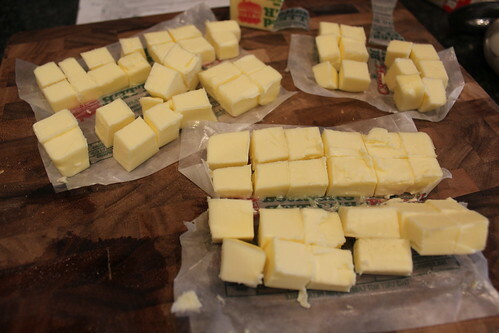 let's start with ice cold butter that miraculously needs to become room temp butter so you can cream it properly! yep, that's what you do. chop it up. let it hang out in your kitchen while you have a cocktail and make dinner. know what goes great with zucchini soup? grilled cheese. nom nom. now you're ready to cream. here's the thing about creaming butter and sugar. you aren't just combining ingredients, or it would be called mixing. what you're really trying to do is to aerate your batter – fill it up with little air bubbles that your leavener (baking soda and/or baking powder) will make bigger. That is what will create a light fluffy yummy cake. letting your butter come to room temp is like a pre-dinner cocktail. it just makes dinner better. it creates better air bubbles. and room temp butter just gives a little when you press it. it isn't half melted cause you nuked it for a few seconds too long. not that i would judge, cause i almost forgot the flour. and the peaches. good lord. ok, now our room temperature butter is getting to know the white and brown sugar. 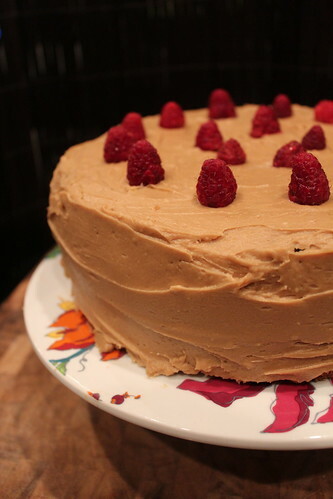 i used dark brown sugar, which gave the cake (and later the frosting) a lovely flavor but a relatively unappetizing uniformly brown color. don't be like me – use dark for your cake and light for your frosting. again, i ask for your patience. 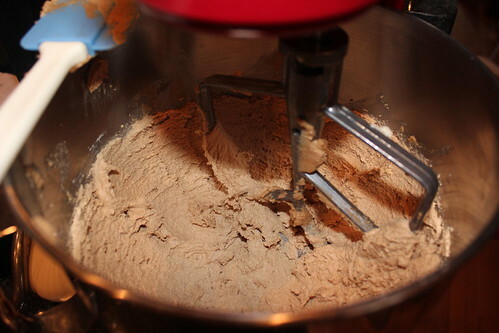 cream at low speed – not above medium on your electric mixer. and you need to give the butter and sugar about 3-5 minutes. if you've never creamed before, it's going to feel like forever. pour yourself another cocktail. eventually, the color will change. check that out! it got all light and creamy and fluffy! these are really atrocious photos. light! i need light! moving on. at this point, you add, in stages, all the other ingredients. seriously. ALL the other ingredients. don't be like me. i put some adorable orange polka dotted cupcake wrappers into my cupcake tin and filled them with batter. then i turned and saw the pile of chopped peaches on my cutting board. ever resourceful, i just stirred a spoonful of peaches into each cupcake. victory! into the oven! while the cake is baking, make your frosting. this is really magical frosting. a little bit of tang from the cream cheese, and true, caramely, brown sugar goodness. 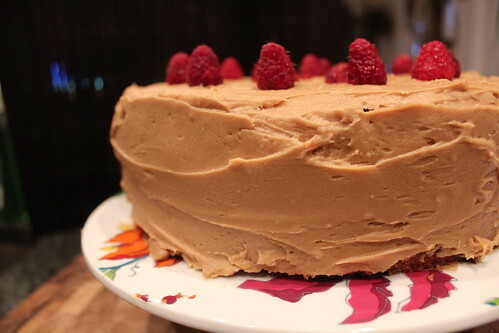 but it needs some time to set up in the fridge – which can happen while your cake is cooling! check out those chunks of peach. 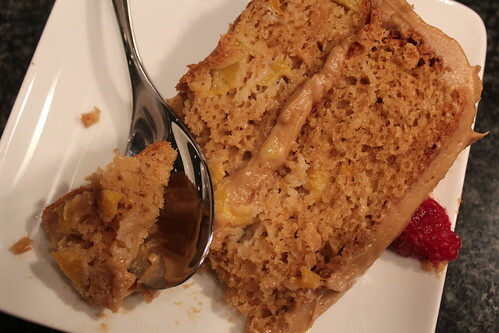 this is a really lovely moist cake due in part to the fruit and the sour cream. the bits of peaches are small enough to infuse the cake with subtle peachiness and still give you bright pops of flavor. 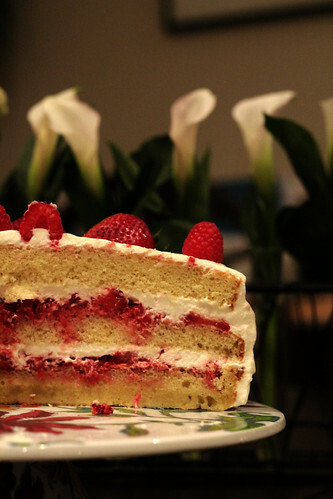 there are a couple of keys to a smooth layer cake. smitten kitchen – also the authoress of this divine recipe – has a great post on it here. 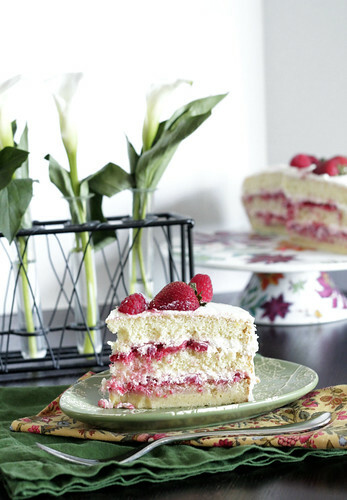 today, i will demonstrate how to frost a crumb-free cake! start with a base layer. not super pretty. 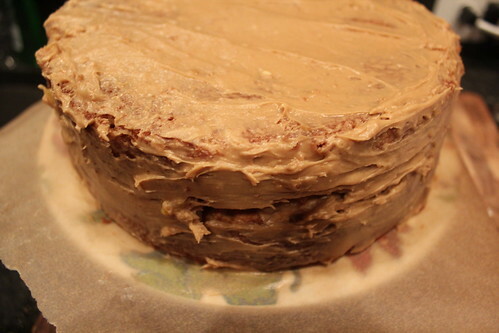 but stick the ake in the fridge to firm up the base frosting layer – i gave it about 20 minutes – and then your second layer will go on smoothly and without any crumbs. kids, this cake is BROWN. but the raspberries sort of saved the day. next time, i'd also add some raspberries as a filling. 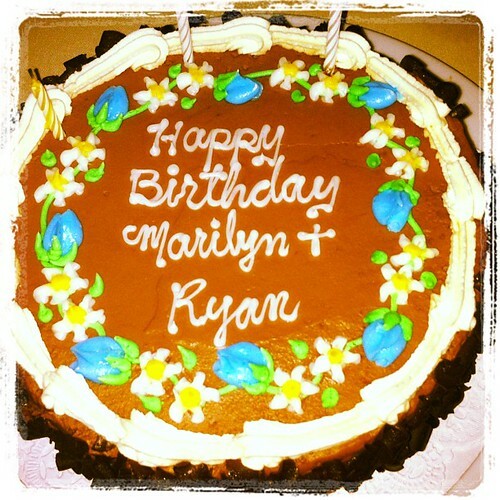 they kick up the sweet-tart of the frosting and break up the sweet-sweet of the cake. From Smitten Kitchen. See this recipe baked as intended here. 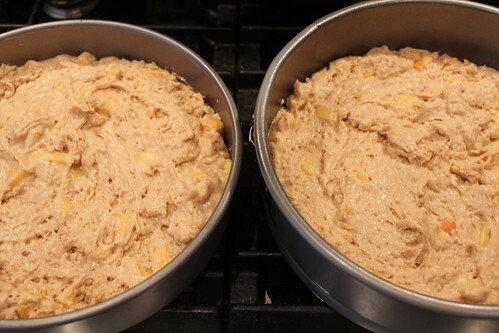 Divide the batter evenly among the prepared cupcake liners. Bake for 18 to 22 minutes, or until a tester inserted into the center of cupcakes comes out clean. Cool the cupcakes for five minutes in the tin, then turn them out onto a wire rack to cool completely. The cake layers were done in about 25 to 27 minutes. i did manage to pit and freeze a good pound of sour cherries this week. remember these? some day, god willing, i'll live in a house with a separate freezer for crazy things like summer cherries, and chicken stock, and, well, everything i want in a freezer that otherwise drives the sommelier crazy. because when there are frozen chicken breasts and cookie dough and leftover adorable little individual servings of browned onion kugel that i just couldn't eat or throw away and that are just AMAZING still if you just microwave them and then you don't have to cook for just yourself on an average wednesday, it can be awfully hard to find the cherry garcia frozen yogurt. that is really all the sommelier wants out of his freezer. can't say i blame him. cherry clafouti! continuing on this week's theme of summer food that is fun to say. clafouti! rhymes with booty! another yummy french dish. "The dish's name derives from Occitan clafotís (Occitan pronunciation: [klafuˈti]), from the verb clafir, meaning "to fill" (implied: "the batter with cherries"). 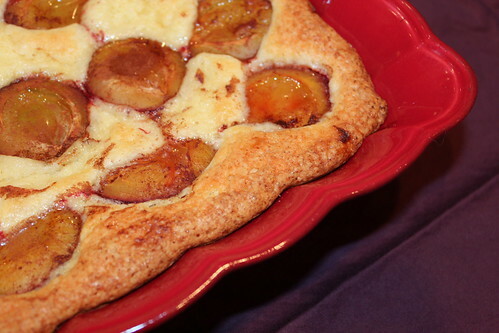 Clafoutis apparently spread throughout France during the 19th century." clafouti: to fill one's batter with cherries. i also filled my batter with lemony goodness. i trew in some vanilla and almond extract too. and left the cherry pits in. apparently that is the "authentic" way to do so, and i'd already thumbed my nose at julia over the ratatouille this week, plus it's supposed to taste almondy-er. it worked out ok for me. just be sure to warn your dinner guests! 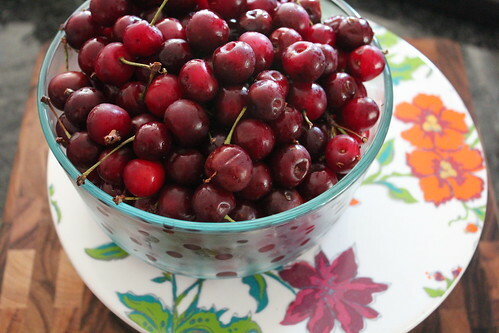 Largeish handful of cherries – tart or sweet, with or without pits. Warm your milk in a saucepan – bring to a simmer but don't boil. If you boil it start over. No one likes burnt milk. Unless it's for dulche de leche. But that's not what we're doing here. Whisk together the rest of the ingredients. It'll be a little sticky. SUPER DUPER slowly, whisk in the milk. Don't scramble your eggs! 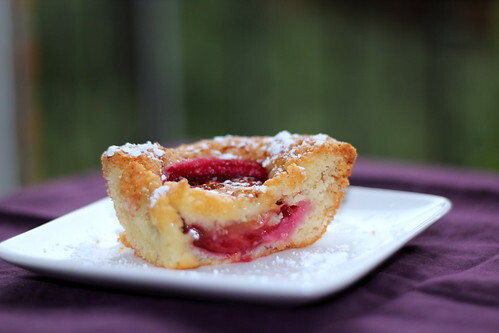 Cover the bottom of four ramekins with one layer of cherries (fill ramekin with cherries!). 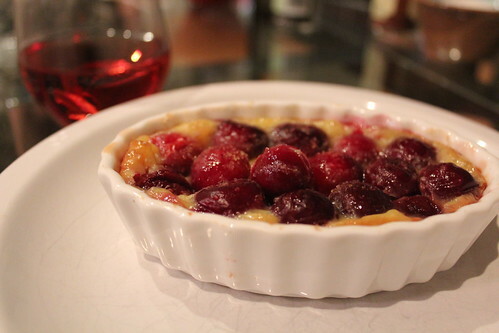 Pour custard batter over cherries (fill cherry-filled ramekin with custard!). 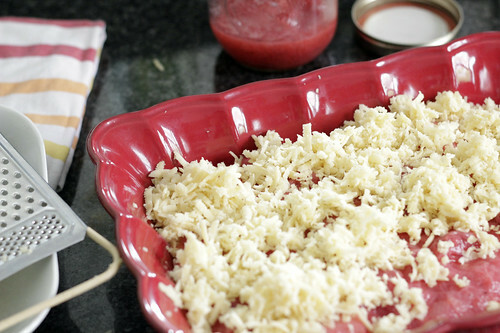 Pop in the oven for about 20 minutes. Then sprinkle with turbinado sugar and keep baking for another 5-10 minutes until set and golden brown. we are hitting that point of summer where i start to get into real trouble at the farmers market. everything looks so good! i want it all! it’s a double whammy when the sommelier goes out of town on the weekend. there is no one to check the madness. no one to question whether we really need TWO QUARTS of sour cherries. i mean, isn’t the answer to that always YES at the end of cherry season? but it didn’t stop at the cherries. while you check out my haul, try to guess the number of humans i’ll be feeding this week. the answer? me. just me. dear sommelier: please come home. yes, i miss you. but also i bought a bunch of kale larger than a small child. 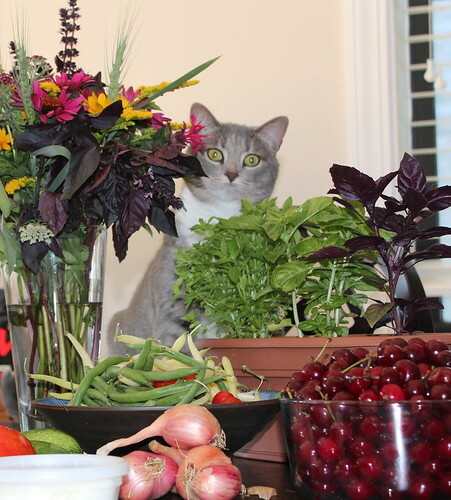 didja see rio lurking amidst the produce? let’s see a close up. this is the point where she runs back and hides under the bed. back to the cherries. 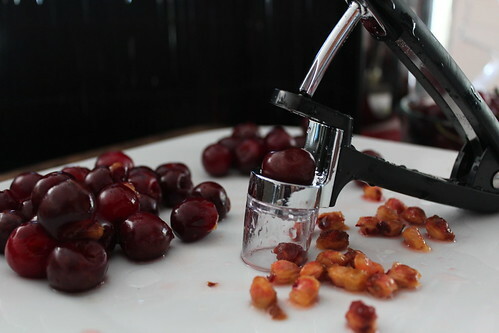 i bought a cherry pitter! file that under other things i purchase when the sommelier is gone: excessive amounts of produce, single-use kitchen implements, shoes . . . .
let me tell you though, that cherry pitter is unbelievable. so much fun. i had purple fingers for so many years for no good reason. 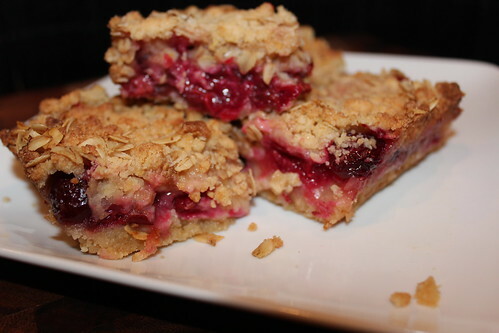 yeah, cherry crumble bars. top notch. 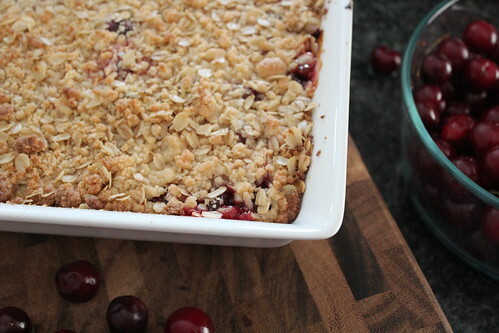 sour cherries + lemon + butter + brown sugar + oaty crumbly goodness = winning. plus, this recipe – itself a bastardization of several other recipes – is a great basis for all kinds of fruity, crumbly goodness. 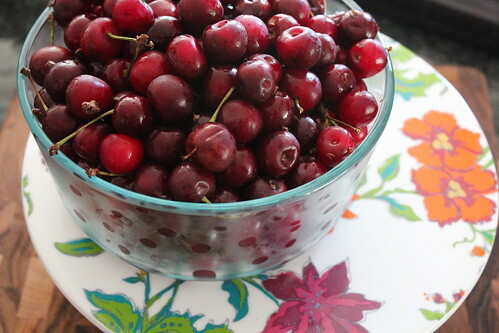 i really liked the tartness of the sour cherries, but any other type of summer fruit would be good. reduce the brown sugar and oats for a blueberry crumb bar like smitten kitchen’s original. or swap the lemon for some ginger for a peachy crumble bar. or add almonds and apricots! Stir the sugars, flour, baking powder, salt and zest together. Add butter and work into flour with a fork, pastry cutter or your fingers until mostly incorporated, then add egg and finish incorporating. It should look kind of like coarse meal, but a little shaggier. Press half of mixture into bottom of a 13 by 9 in pan. 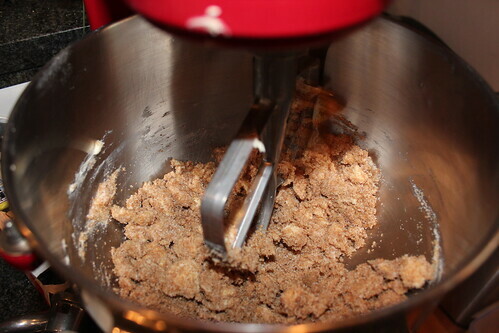 Add oats to the remaining half for topping. Mix cherries with lemon juice, 1/2 cup sugar and corn starch. Pour over bottom crust. Sprinkle reserved oats mixture on top. 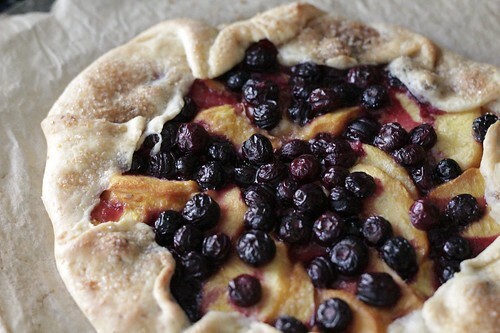 Bake for 30 to 45 minutes until the topping is golden brown and the cherries are bubbling. It shouldn’t be too wiggly in the middle – it’ll firm up a bit. But mine stayed a bit gooey. Which I love. But not everyone does, so just watch it, ok?